GATE 2019 Score Card has been released on 20th March 2018. 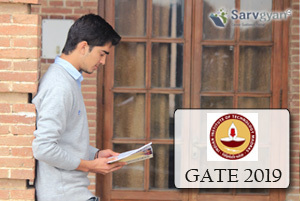 GATE exam is organized by the IITs on rotation basis. For the session 2019, it is conducted by IIT, Madras. Graduate Aptitude Test in Engineering (GATE) is conducted for those candidates who are seeking admission in the ME/M.Tech & other programmes. Through GATE exam, students can get admission in various IITs, NITs & other Institutions. Here, we have given the detailed information about GATE 2019 Score Card. GATE 2019 Score Card is available now from 20th March 2019. Click here to get GATE score card. After the GATE 2019 result declaration, successful candidates can download their GATE score card 2019. The score card has been released on 20th March 2019. Candidates can download it till 31st May 2019. If any candidates needed the soft copy of their score card after the due date, they have to submit the fee of Rs. 500. GATE score helps the candidates to get admission into M.Tech/ME & other programmes in various Institutions. Candidates can also use GATE score card for PSUs recruitment. The score card is not provided through offline mode. The score card is valid for three years. Candidates must secure the printout of the score card for further admission process. A new page will be opened on the screen. Enter all the required details such as Enrollment ID/Email Address, Password & Security Code (Captcha). After filling the details, click on the “submit” button. The score card will be displayed on the screen. Save the score card and take printout of it. Candidate must secure the printout of the GATE score card for further use. Mq=qualifying marks for general category candidate in the paper. If you have any other queries regarding GATE Score Card 2019, you can ask us by commenting below. how could i get valid gate score card in original? I forgot my goaps password, kindly suggest….. I am losed my mobile number….My enrollment is:G625A74.and I am forgot my password…how to check my score card…plz tel me solution.. Try again, It might be because of server problem. visit the official site of GATE. How can I get the gate registration ID? Please help it’s urgent. Plz help how can I get the gate registration ID? I HAVE NOT GET MY ORIGINAL GATE2017 SCORE CARD….PLEASE HELP HOW TO TAKE IT.. I need my registration no .what i do for it? Plz let me know from where can I get I score card of gate 2017. As it is mandatory for admission process. Plz it’s urgent. is scorecard displayed after login on website is valid for ME admissions?? Is there any way to get my gate registration number ? ?I lost my admit card .now I am not able to download my admit card also .IS there any way ??? Check your registered email id or mobile number. Is there any way to get my gate registration number ? ?I lost my admit card .now I am not able to download my admit card also .IS there anu way ??? I was not download my gate 2017 score card until 5th may. what can i do for downloading score card in todays date with unqualified marks. i got 7 marks in OBC category. please suggest me.. I haven’t downloaded my gate score card yet….how can I download it before 26th may,2017. I am postgraduated and have been declared qualified for gate 2017. i need only the qualifying certificate. What i have to do. I getting 8marks in GATE 2017. I need my gate score card how can i get it. CS Gate2017 AIR 9918 ; Gate score 377 ;which institute can expect ? No received any otp and mobile number out of service the how to check result. We have given the link in our article. Pls send the link to download answer key. LPU 2019 Applications Open. Few Days Left Now.